Keeping house is like stringing beads with no knot at the end of the string. Every day brings its challenges. Some days bring little ones and some days big ones. As we move through life we deal with whatever challenges come our way and keep moving, often so quickly that we hardly notice or recognize the effect on us. This isn’t bad but sometimes we gradually slow down. The friction of getting through each day brings our mood down. It forces us to re-evaluate how we’ve been spending our time and to look at what we want to do going forward. 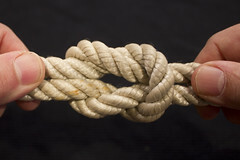 …my life was full of knots, which (although they held my life and self-understanding together) choked off my connection to my true self. When threads are tangled together, it’s almost impossible to differentiate one from another. They overlap and interweave and you cannot see where one thread starts, where it stops, and what path it takes to get there. Our motivations get lost in our choices, our presents get confused with our pasts, and our conscious behaviors get entangled with our subconscious desires. It’s all but impossible to identify these threads and how they interconnect when they’re knotted together. Being involved in life is a good thing. Being of service is also a good thing. It’s just that sometimes we have too much of a good thing and we need someone to help us disentangle ourselves from our over commitments and find ourselves again. In the end what I know is limited to the challenges that I’ve faced and the beliefs I’ve developed around dealing with those challenges. If I know something about learning or depression, it’s because I needed to know it to solve a problem. Because I knew that I was sooo wise, I decided that becoming a therapist would be a perfect thing for me to do. And, I certainly understand a fair amount about how we think and why we see things in certain ways. What I never quite understood about my “perfect” career choice was that it’s about listening and understanding someone else’s point of view, not about showing off how intuitive or smart or insightful I am. Bummer! I’ve always wanted to help others, hence my idea of becoming a therapist. For a while I volunteered teaching job hunting classes to women who had run away from abusive husbands. Since I had run away from abusive parents, I figured that I understood what was involved in making and executing that decision. Needless to say, I was (and probably still am) clueless. I also have a real fear of powerlessness. Probably most of us do, but when I can’t help I get really, really angry – not good for a therapist. Over time, I’ve learned that things are often more complicated than I understood. Now, the only thing I know for sure is that I’m slightly better at being with other people because I know I’m clueless – some change, not a lot, but some. I still don’t shut up. The good news is that at least I didn’t spend three or four years studying and then interning – to discover that listening and then allowing someone else to run their life their way just isn’t my cup of tea. It has taken age and maybe some “wisdom” to understand how difficult it is for us to change – even to change our opinions. In my family, only crazy people went to see therapists and by choosing to go for help, you were admitting you were crazy. It wasn’t until I was listening to one of Scott Peck’s books (sorry I don’t remember which one) that I understood that the purpose of therapy was to help you grow. As I struggled through various challenges, I eventually found a therapist who didn’t do “long term” therapy, rather he helped you figure out what was bothering you. He understood people and could show me what I hadn’t understood in a situation. With my long term issues with my family, I had lots and lots of knots that had formed throughout my life. As some of them got really big, I’d go in and work with him. It kept me from feeling as if I were a victim of my family and it helped me to develop healthier approaches to dealing with those particular issues. If we’re lucky, with age comes wisdom. Often, just when I think I know a lot, life kicks me in the teeth and shows me how much I have to learn. The image that McHugh created of knots in our lives helps me to understand why I struggle so. The knots are like speed bumps. They slow us down. There is the theory of human behavior and there is the reality of the humans in our lives. The reality is what creates our knots. Our challenge is to take apart those knots to create the life and relationships we want and get back up to speed.